The entrance to the Shuttle Launch Experience, still blocked by temporary walls in early May 2007. Go behind the walls and enter the attraction on collectSPACE.com. The nextgroup of people to experience launching aboard one of NASA's space shuttleswon't be astronauts. 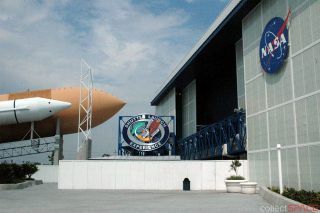 While NASAhas June 8 planned for its next liftoff from Kennedy Space Center's Pad 39A, just seven miles away thousands at NASA's official visitor complex will havethe opportunity to board the new Shuttle Launch Experience (SLE), opening onMay 25. The 44,000square foot, $60 million ride -- or as it's more accurately-described,simulator -- was designed to give visitors to the Florida space center whatthey expressed they wanted most. "Wewanted to show people what it was like to fly in space because in our exitresearch, of the people who come here, it's all about launch," explainedDan LeBlanc, chief operating officer of the visitor complex, during anexclusive early tour of the SLE with collectSPACE.com. "Therewere arguments about whether we should do shuttle... or whether we look at afuturistic [craft]. Our argument was, if you do future, than you areessentially science fiction and then there is no point of difference with whatis going on 50 miles from here. We've got to stay real," stressed LeBlanc. "There'sno asteroids. There's no aliens. You don't even have an emergency on your wayto orbit. In fact, we don't even tell people we're putting them on the shuttle.The marketing line is that this is a simulator. NASA had a lot to do with theearly development of simulator technology and that's what it is, a motion basedsimulator designed by NASA and the astronauts to show people what it's like, asbest we can within the confines of gravity, to fly to space aboard the spaceshuttle." Toaccomplish that sense of realism, LeBlanc and his team turned to formerastronauts like shuttle commander Rick Searfoss and Bob Rogers, founder andchairman of BRC Imagination Arts, a leader in the field of museum design. Rogers previously worked with the KSC Visitor Complex to design and build itsApollo-Saturn V Center. "Rogersis our story teller, the same guy who did all the story telling out at theSaturn V, who took what is not a lot of twists and turns like on a rollercoaster, but who took that experience and turned it into something reallyemotional," said LeBlanc. "There'sgoing to be a lot of learning going on in here but more than anything we wantthis to be emotional. We want to create an emotional attachment to the spaceprogram. We want people, after they do this, the next time they see a shuttlelaunch or a CEV launch, they can say, 'You know what, I know a little bit aboutwhat that feels like.'" Continue reading about the Shuttle Launch Experience withexclusive behind the scenes photographs of the attraction, only atcollectSPACE.com.